This scene showcases two of our favourite cars in their full GT3 race spec, The BMW Z4 & BMW E92. Below we will run through our process of lighting, and texturing the full scene and we’ll also throw in Free Vray materials for you to download and use in your own scenes. All images below can be clicked on to be enlarged. We have used a composite material so we can overlay tyre marks onto the road. This allows us to tweak the asphalt material as much as we like without affecting our tyre marks. We used the dirt texture map to generate puddle reflections in the scene, with our asphalt texture serving as a base for our track. 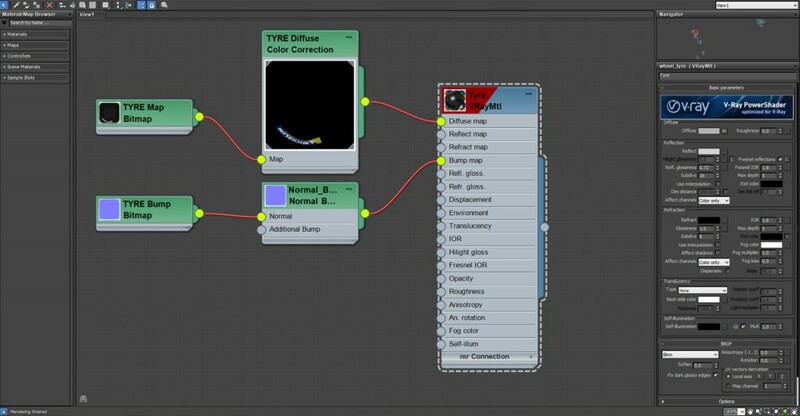 For our Kerbing we did create a bespoke UV texture map which doubled up as both our diffuse and bump map. Our concrete walls consisted of a single texture map once more, with another material to overlay the sponsor graphic on each concrete block. Our metal fencing was created using a bent plane along with a UV mapped opacity map. Moving onto our car models, see below the textured models for both BMW’s. Both cars had their own custom UV map unwrapped. The car paint material uses the custom UV mapped livery along with a slight speckle reflection map. Our tyres use both a diffuse and a normal bump map. The wheel rims also use a diffuse for the rims, and brake calipers, along with a normal bump map. Our simple carbon fibre material includes a diffuse and bump map. Our main source of light for the scene comes from a HDRI map attached to a dome Vray material. The HDRI map itself can be found in Evermotion’s Archexterior Vol 17 which you can download from here. 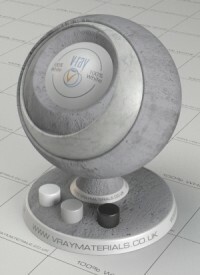 We also use a Vray Sun & Sky to help define the lighting, reflections and shadows. We used a Vray Physical Camera to capture our scene. 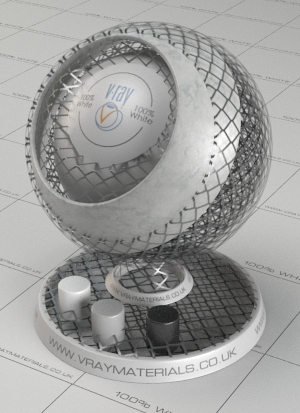 Here is our beauty render straight from 3Ds Max. This image shows our post production breakdown. We added a few passes to the RAW image to add effects including DOF, Particles, Light bloom & Glows and finished with a colour correction pass. And here’s our final result. We hope you found this project breakdown and run through helpful, and be sure to download the materials used in this project below.